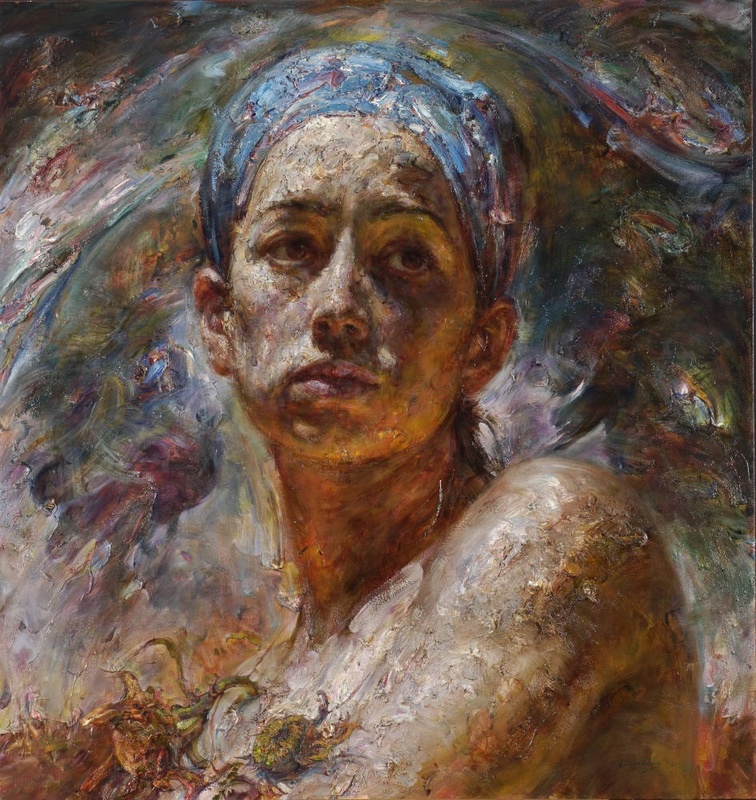 Odon Wagner Contemporary presents The Face of Light a collection of paintings by Chinese-American contemporary artist Victor Wang. A selection of these oil & mixed media paintings are available for purchase. Please contact the gallery for further details. Victor Wang paints about the human experience. He paints worry and wonder, sadness and joy. His women, carefully rendered in sensual texture and emerging from shadow, are wise and thoughtful. 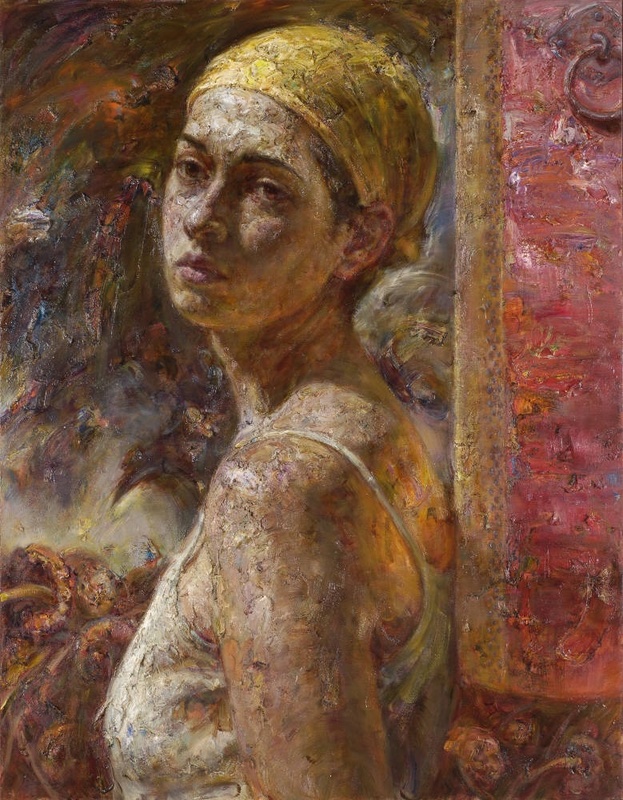 His paintings, however, are not merely portraits because his subjects are more familiar than that, seeming somehow to represent people we could know. At times we even see ourselves in their upturned and outward-facing expressions. Even when meditative and inward-looking, as Wang's women sometimes appear to be, there is no denying the strength behind their eyes. His subjects seem captured in a moment of stillness in time's otherwise unyielding march toward the future. At times his paintings look like abstracted film stills—vignettes taken from much more complex dramas—Wang's frames only revealing a glimpse into a much longer narrative. These women are strong and capable but tempered and even, as if stopping to contemplate and understand the significance of the moment before taking the next step. They are readying themselves before turning the page, preparing for the next chapter. When asked about his artistic influences, Wang doesn't miss a beat, reeling off centuries of art history without hesitation. The true artist, after all, is always studying—absorbing the work of his artistic forefathers, constantly scrutinizing their creations. The early Baroque artist Caravaggio is the most discernable influence, his presence lurking in Wang's inherent understanding of light and shadow. Wang understands chiaroscuro in the very core of his being. His subjects, always lit from mysterious source just beyond the edge of the canvas, appear to be carved out of darkness, light drawing out delicate features and intriguing expressions. It was from Twentieth Century German artist Anselm Kiefer—and his raw, sometimes messy mixed media landscapes—that Wang learned to appreciate the canvas' changeable identity; namely, that a painting, dangerously chaotic up close could appear almost orderly from a few steps back. And it was from studying Gerhard Richter's work that Wang learned to admire what he describes as 'speed and stillness'- and about how both can co-exist on a single canvas. Auguste Rodin's sculptures taught Wang that he could use his brush like a modeling tool, inspiring him to paint rich, tactile paintings where evidence of the creative process can be felt in every thick, physical stroke. But the influence of his formative years in China is never far from the surface. 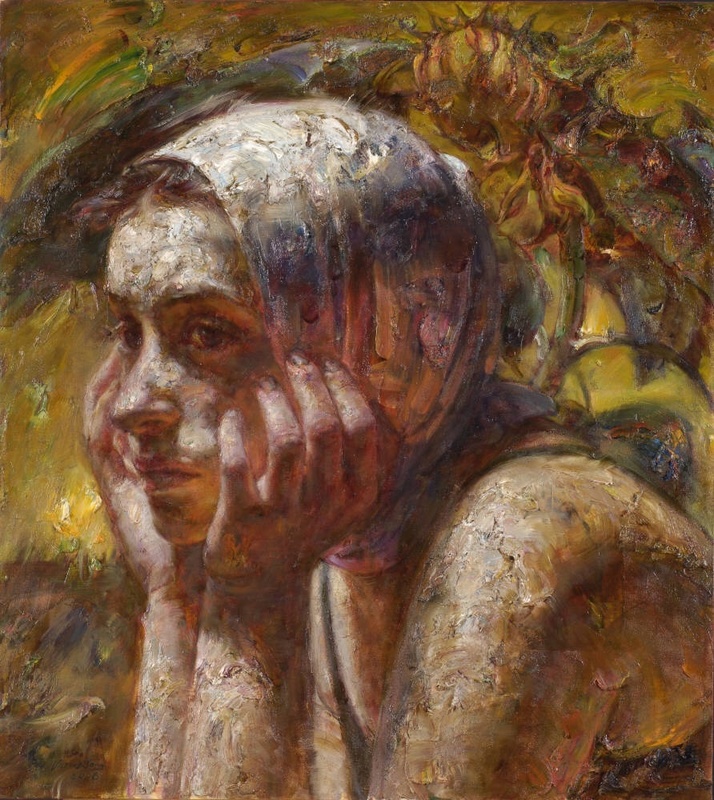 It was there that he received his training at a traditional art school that embraced the Academic approach to painting. 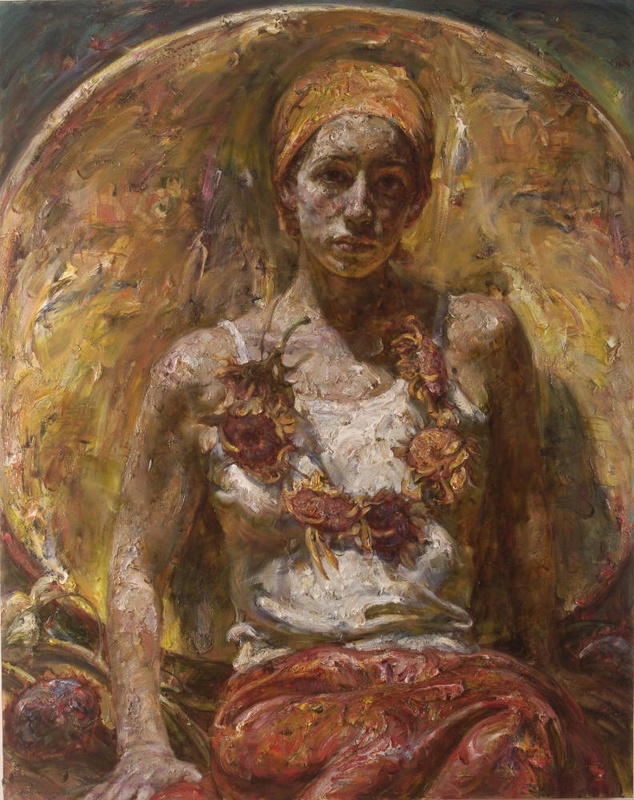 But as technically skillful as Wang's paintings are, they are also steeped in experience, the artist's own learned wisdom transposed onto the faces of his subjects. 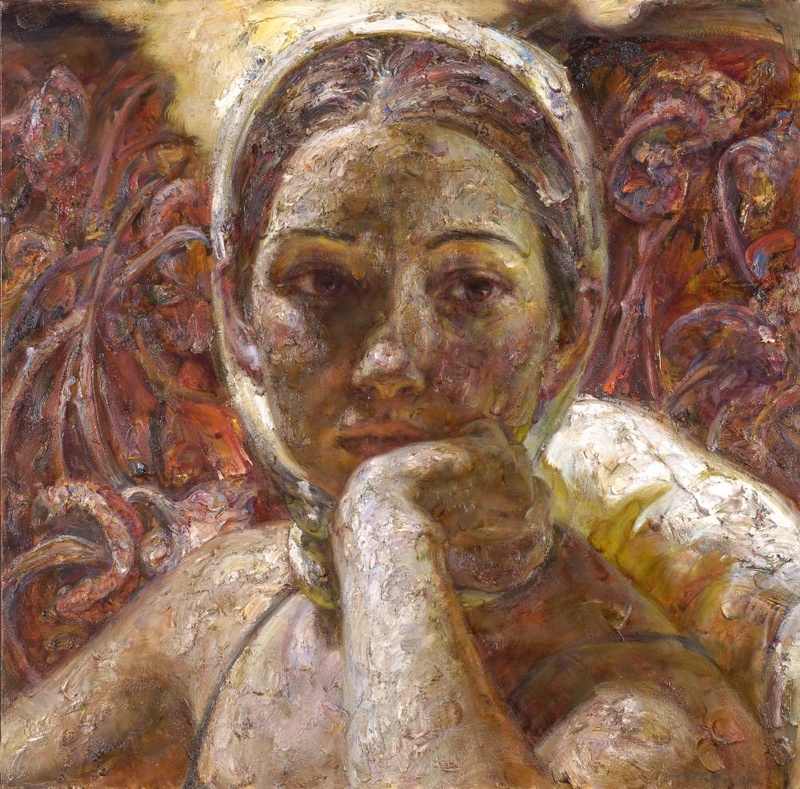 There are traces of Wang's biography in nearly all of his paintings. 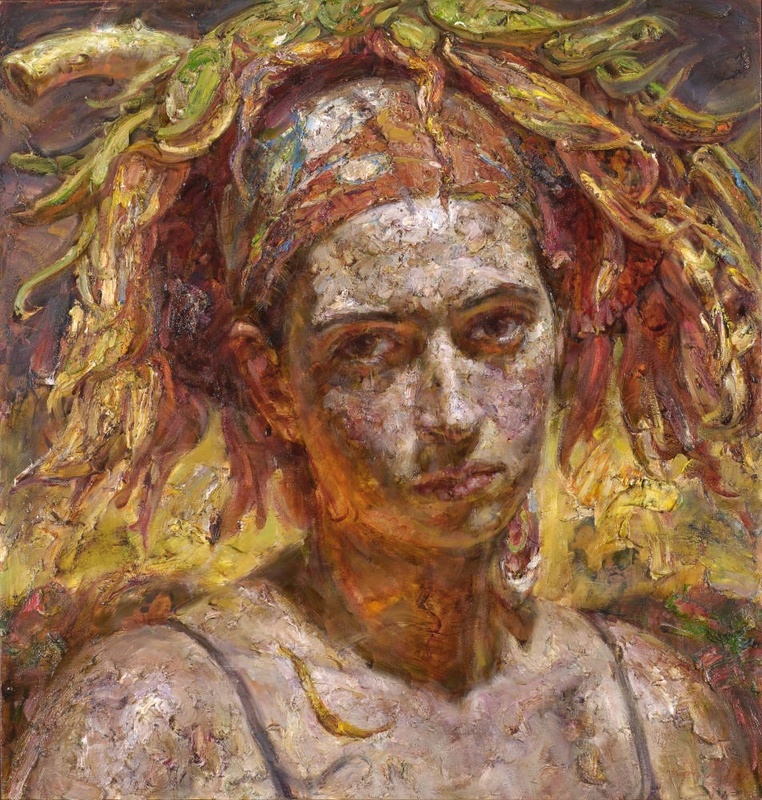 The sunflowers, for example, which grow up behind his subjects, or hang like garlands around their necks, are as integral to his pictures as the beautiful women he paints. In Chinese culture, the sunflower is fraught with meaning. Mao Zedong appropriated it for his personal gain during his reign, using the sunflower as a symbol for a devout Chinese people following his leadership the way the flower naturally seeks out the path of the sun. The flower is still used in China to symbolize the human race, beaming up at the sky like open-faced flowers swaying in the breeze. For Wang, the sunflowers evoke feelings of both personal joy and sadness. He remembers playing in sunflower fields as a child growing up in China, carefree beneath the huge, yellow heads and in amongst the sturdy stocks. The flowers became more sinister, however, when the urban-born Wang, after graduating from high school, was sent to a labour camp in the country for his 're-education' during China's Cultural Revolution. There he was subject to grueling farm work, much of it working in the fields without the help of equipment. Often, he would find himself working in corn and sunflower fields from sunrise to sunset. Describing the work as 'miserable," Wang still finds it difficult to separate the painful memories from the pleasant ones when he sees a field of sunflowers. As a result, the flowers that he paints hover in a place somewhere between life and death. Aesthetically, Wang says, he prefers the colour and energy found in a drying flower, the shape twisting and tightening with the loss of moisture. The headscarves, which nearly all of Wang's women wear, serve a dual purpose. 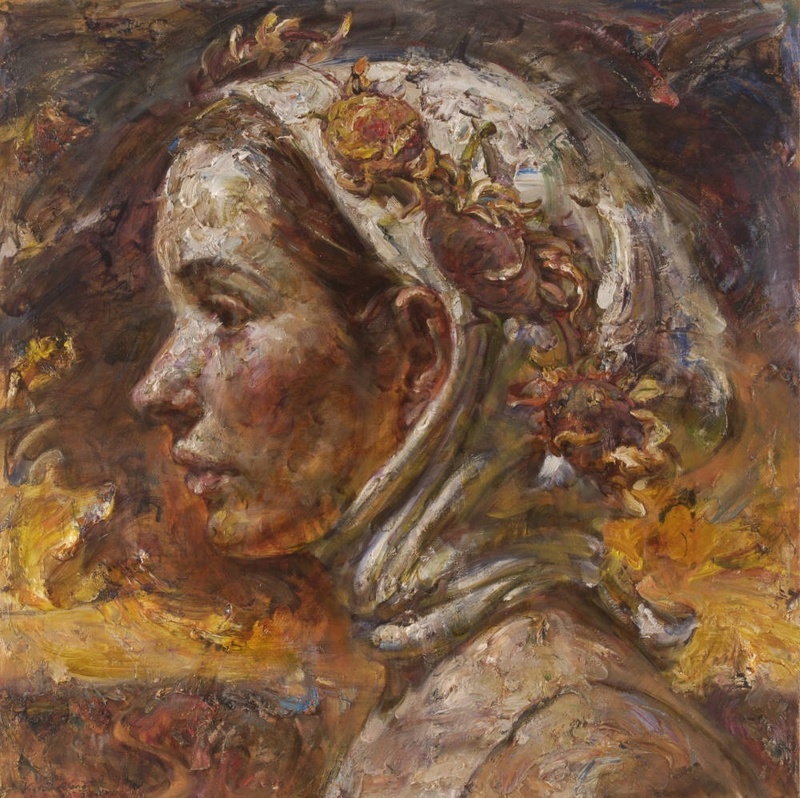 By covering his subject's hair, the artist is able to draw more attention to her beautiful features, but they have a functional meaning as well. The headscarves are typical of the kind worn by women in North Eastern China—the region where Wang grew up—where a scarf helps to keep the winter chill at bay. although it may only flicker across his subject's faces for a moment at a time, that undercurrent of initial contemplation and worry has never entirely left Wang's work. As if consciously acknowledging his ancestry, Wang always incorporates found images—usually figures— from China's Tang Dynasty into his paintings. Hovering like spirits in the backgrounds, the collaged images serve as inspiration and remind the artist of where he comes from. For Wang, it is a way of indicating visually that the past is never forgotten. "It is my ancestry in the background", he says of the ethereal images lurking in behind his elegant subjects. "Here," says Wang, as if he were offering us a small piece of himself in every painting, "is my heritage."